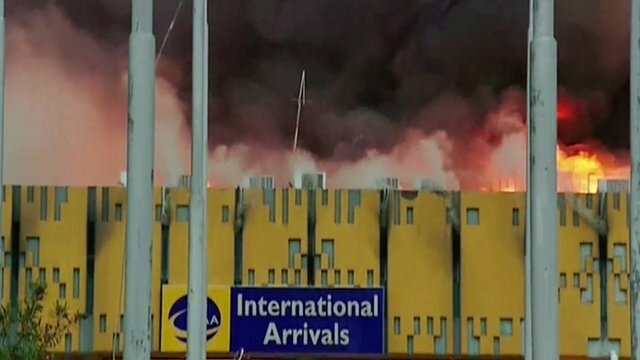 International flights have begun landing at Nairobi’s international airport a day after fire gutted the arrivals hall, causing serious disruption. A plane from London was the first to land at Jomo Kenyatta International Airport at 06:30 local time, Kenyan airport authorities said. Other planes from Bangkok and Kilimanjaro also arrived. The cause of the fire is not yet known. Kenyan authorities say no serious injuries were reported. The Nairobi airport is a regional hub serving more than 16,000 passengers daily and its closure caused widespread disruption. International flights into the city had been diverted to other airports in Eldoret and the coastal city of Mombasa. On Wednesday the interior ministry announced the resumption of domestic and cargo services. The fire took about four hours to bring under control, by which time the arrivals hall had been gutted. The Kenya Airport Authority (KAA) said that Kenya Airways flights were arriving and taking off “now at more or less normal operations”. Other international airlines had not yet clarified their operations, it added. The fire started in the airport’s international arrivals and immigration area at around 05:00 on Wednesday and spread quickly. Questions are being asked about why so few fire engines were available initially. It appears that some engines got stuck in the Kenyan capital’s notorious traffic jams. Many engines at the scene also quickly ran out of water. Soldiers and police even came with buckets to help put out the fire, Sylvia Amondi, who was at the airport to pick up a relative who had been due to arrive there, told AFP news agency. A third of Europe’s flower imports, and many fresh vegetables, come from Kenya and the Kenya Flower Council exporters’ association described the fire as “disastrous”. Shares in Kenya Airways, which uses the airport as its main hub, fell 2% after the fire. Foreign airlines which use the terminal include British Airways, Emirates, Qatar Airways, KLM, Turkish Airways, South African Airways and Ethiopian Airways. Several cancelled flights to Nairobi on Wednesday. The country’s anti-terrorism chief, Boniface Mwaniki, has said he does not believe the fire – which happened on the 15th anniversary of the bombings by al-Qaeda of the US embassies in Nairobi and Dar es Salaam, Tanzania – was connected to terrorism. Correspondents say the airport is old and overcrowded.